I will teach you to create amazing music in Logic Pro X, one of the most powerful DAW(Digital Audio Workstation) platforms that apple has created. You can design soundscapes by using apples amazing library of apple loops which are royalty free or record your own audio and create your own samples in Logics powerful Ex24 sampler. I will teach you to make you own drum beats using Logics powerful new “Drum Kit Designer” which will even play fills when moving to a new part of your arrangement. I will also show you how to use the fantastic collection of instruments and soft synths that come bundled with Logic Pro X. They include B3 Organs, Vitage electric Pianos, Strings,Pads,sound effx and so many more mouth watering sounds that I can’t even begin to list them here. Not only does Logic Pro have amazing sounds and plugins built in, but you can use a multitude of third party plugins.I will show you how to use rewire. 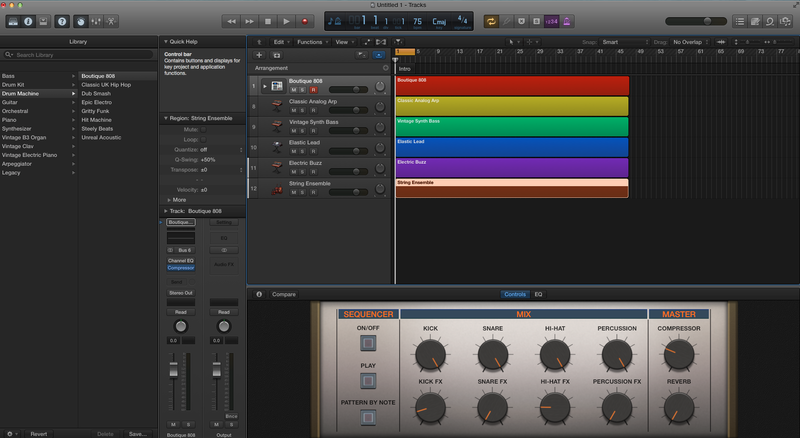 This will allow you to use other programmes like Reason and Albeton within the mixer of Logic Pro. Logic has some wonderful effx Plugins and I will introduce to the powerful Reverbs, Delays, Compressors and other useful tools which are all part and parcel of what Logic Pro has to offer. There are many short cuts which make various tasks much easier to access and these can be customised to suite the user. I will show how to customise your shortcuts which will greatly speed up your workflow. These are just a few of the powerful tools which Logic Pro X has incorporated into this powerful package. I can help you learn how to access these many exciting and creative options which sometimes are lurking just beneath the surface waiting to be discovered.